That October day in 1983, the warmth of the “ultimate bungalow” coaxed us through the doorway like an old friend. 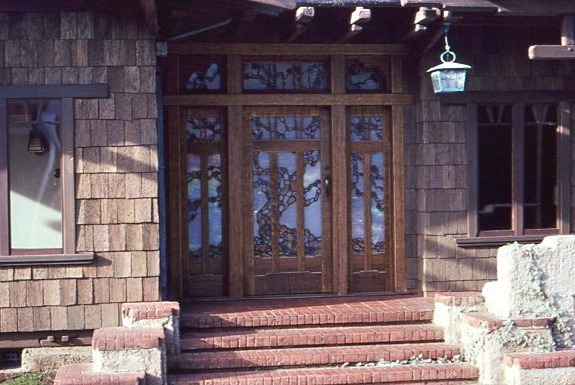 Muted light radiated through the stained glass entry doors, reflecting off the oak floors, lustrous teak and mahogany walls, tiled fireplaces, the Tiffany-style light fixtures and windows. The fireplace inglenook, large, airy rooms, deep chairs, and hand-loomed carpets promised comfort in the winter months, as well as shelter from summer’s heat. The house was a work of art designed for people. There was a tranquility about it that was palpable. The house is the Gamble House, now a museum in Pasadena, CA. Designed by Charles & Henry Greene as a home for the Gambles (of Ivory Soap fame), right down to the carpets, it was completed in January, 1908, a mere 11 months after the start of construction. Grover Cleveland was President, and the first Hershey’s Kiss had just rolled off the production line. The Gamble House is dubbed the ultimate bungalow because it is considered their finest and most unified architectural statement. Our surrender to its charms marked the beginning of the love affair, and the ghost story, culminating in our completion of the Greene & Greene miniature house 6 years later. The ghosts would be Charles & Henry Greene, glowering or chortling over our shoulders as we worked, not telling us we were making mistakes until they were complete and staring us in the face. And it would be years before we understood the scope of their genius. and knew we wanted to wade in deeper. As fate would have it, a customer was waiting. At the 1985 NAME National miniature show, Pat & Walter Arnell asked if we’d like to build another Greene & Greene, maybe even the Gamble House. We were elated, but also a little anxious about rekindling our affair with the Greenes. There had been so much trial and error on the first, so much hair-pulling, and we knew there would be more. Somehow we lulled ourselves into believing a second house would be easier. 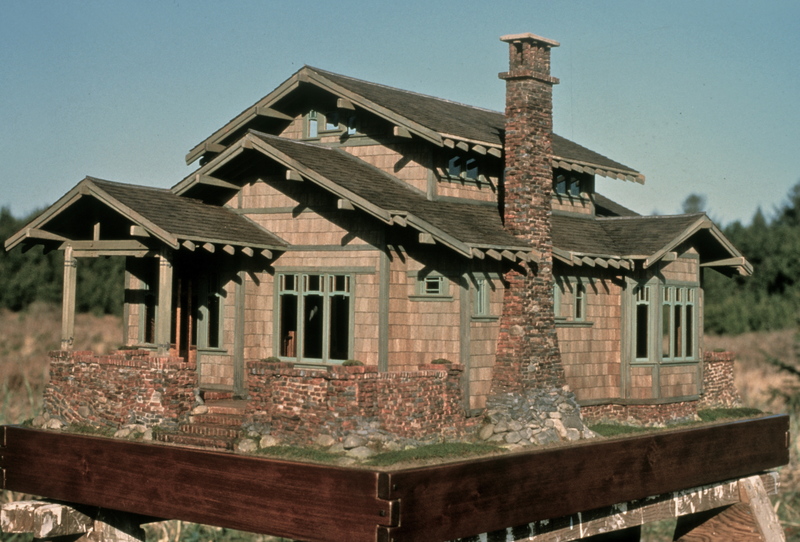 In February 1986 we returned to the Gamble House, and discovered we were even more knocked out by it than before. It was the 20th anniversary of the museum, and most of the visitors were architects and students–Greene devotees. We all padded around in our socks, speaking in hushed tones, as if in church or at a golf match, pointing out this scarf joint, or that cloud lift. Noel and I got so fired-up our brains went into overload–we vetoed continuing to the second and third floors and drove the 1000 miles home with more than enough food for thought and conversation. In October 1986, while Reagan was President, Noel began putting the Greene & Greene on paper. The house wouldn’t be complete for another 3 ½ years, just before George H. W. Bush was sworn in. We had come home from Pasadena armed with books, slides, and postcards, each providing us with more details, another look at the house 1000 miles away. We spent the ensuing months poring over them, deliberating, planning, juggling all the information. The original structure covered 8000 sq. ft. Noel’s most crucial job was to determine what the Greenes would have done if they’d made the house smaller—what would they have left out while still maintaining the integrity of the design? It was like trying to figure out what Shakespeare or Beethoven would have left out of their finest works. 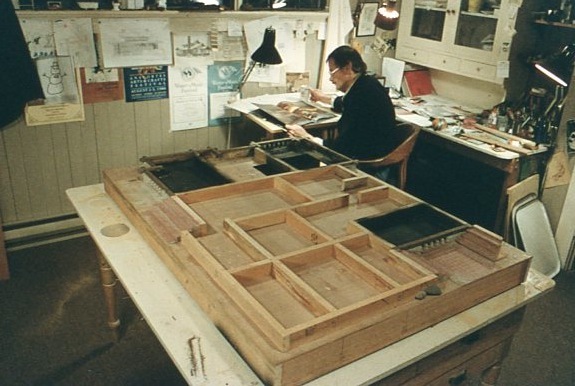 He let it all filter through, and what emerged was a design for a modified, condensed version of the Gamble House that most people never suspected was not a copy of the original. It didn’t fool Charles & Henry (as we had come to refer to them), who had returned to haunt our waking and sleeping hours. This entry was posted in Bio, Houses, Miniatures and tagged architecture, Bungalow style, dollhouses, Greene & Greene, miniatures. Bookmark the permalink. I enjoy your telling the stories of your houses ! Wow, love letters, that’s great. I’ll have to write some more. I fell in love with the Gamble House on a visit with my parents and again when I saw your house in progress at a NAME event. More fabulous in miniature as you can realize the genius of the design. Yes, wouldn’t it be grand! I am a granddaughter of Henry Mather Greene. He lived with my family for the last fifteen years of his life, so I knew him well. 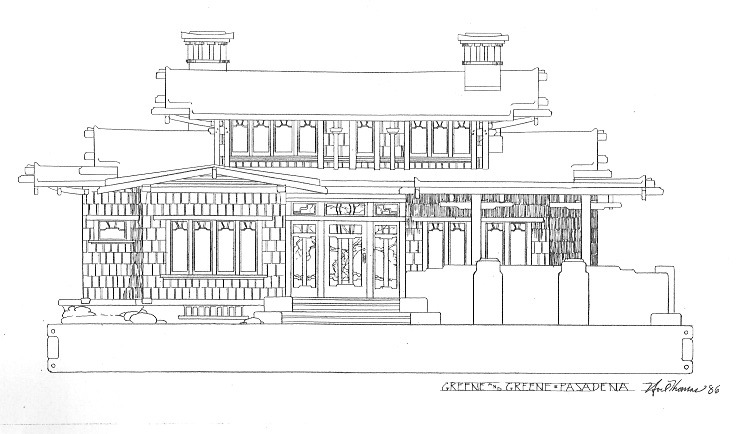 I think Grandpa and Great-uncle Charles would have loved your miniature Greene & Greene houses–they are delightful! Especially the great effort and detail you have put into them. Thanks for writing about it. Are you still doing this now? I am working on a narrative history called: Greene & Greene: Their Ancestral Heritage, 1550-1900. I found there were master anchorwrights and housewrights in their Greene and Sumner background, so it has been a fun journey! How wonderful to hear from you Virginia–it gives me a little shiver to hear from “our” Charles and Henry’s descendent. But a good shiver, a connection to such inspiring men. I’m glad to hear you think they would approve of our work. No, we are no longer making houses–64 was enough. I am writing and Noel is painting. Your book sounds like a great project–such a fount of details to uncover–they had so many talents. Thank you for making contact! Ive always been a fan of both your work. Your attention to realism is one of my biggest insporations. I have always loved ypur subway tile work. What did you guys use to make these? I wish you guys were still doing classes! Thanks, Chris. Early on we used porcelain tiles made by Marie Friedman. The ones in the Green & greene we made by lightly scoring Strathmore bond paper and then, I think, spraying it with Clear Krylon. Matte, or glossy, can’t remember. It might be on one of the blog entries. Or just experiment.